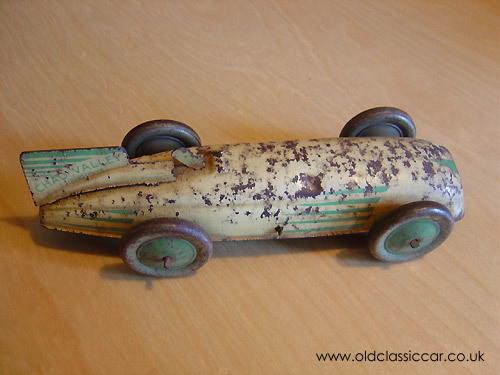 The Chad Valley racing cars like those shown here, came in at least two different sizes, both powered by a clockwork mechanism and made in the usual tin plate method of construction. The first picture shown here, of a car in cream with green stripes, is showing signs of age due to the corrosion that has broken out over its bodywork. However to repaint it successfully would not be easy at all, so I plan to preserve it 'as is' rather than attempt a re-paint, that probably wouldn't work out too well anyway. Originality is what most collectors look for when it comes to tin toys, even if they are slightly down at heel like this one. Photographs 2 & 3 were sent over by John, showing a couple of tin land speed record cars by Chad Valley that he owns (thanks John). Colour: cream, green flashes, clockwork motor.